Using a mandolin or sharp knife, core and thinly slice the apples into wedges. Toss the apple slices into a medium skillet. Add the cinnamon, nutmeg, vanilla and brown sugar. Sauté on a medium heat for 5 minutes, or until the apples have softened a little bit. Transfer apples to a small bowl and stick them in the fridge for 15 minutes, letting the apples cool. While they cool, preheat the oven to 375°F. Roll out the biscuits on a floured surface until you get roughly 6-inch circles. Evenly distribute the cooled apples among one half of the 8 biscuits. Top with a small handful (about two tablespoons) of marshmallows. 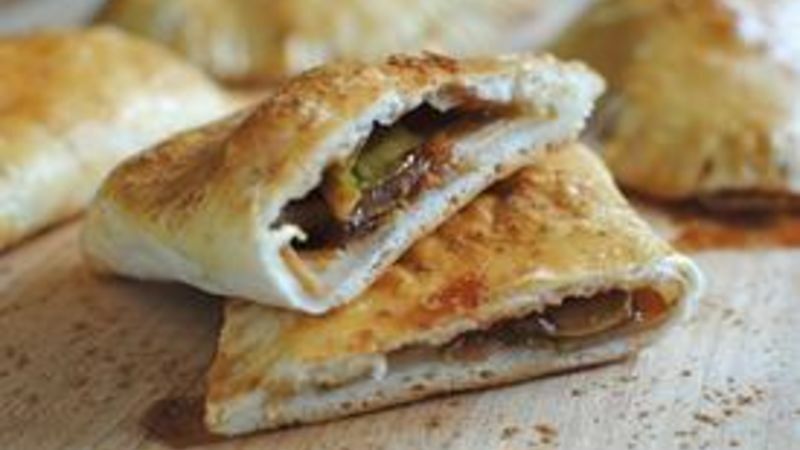 Fold over the biscuit dough, pinching the ends together to create an empanada. Then, using a fork, crimp the edges to make them ridged. Place each empanada on a rimmed baking sheet, lined with parchment paper. Then brush each one with a light egg wash. Bake for 15-20 minutes, until the tops are golden brown. Lightly dust with more cinnamon and serve immediately. Fall is busting out all OVEERRRRRR. That song works for this time of year too, right? No? Oh. WELL, it's HERE, you guys and we need to talk. Fall is my favorite time of year – well, fall and spring. My grass hath greened up again due to some more regular rainfall. Wait, have I told you that rainy days are my most beloved? They are. I think it's because I'm hyperactive. I need those calming drizzly rainy days to even me out. It's like, science. Anyway, the other day we had a most random thunderstorm pass through, and I completely lost my mind. I was so excited it was like the Publishers Clearing House barfed in my soul. So I had to do something to celebrate or else I would totally freak out and die. And because I like to throw you for a loop once in a while, I BAKED A DESSERT. Riiiight? I made these Apple-Cinnamon Empanadas to celebrate the rain and fall and the fact that I'd just made a decision about my next hairstyle, and can I just say something? Holla. Back. Y'all. These empies are seriously going to do some sweet, sweet damage to your mouth. Alright! Grab a tube of Pillsbury Grands biscuits, a couple of green apples, some brown sugar, ground cinnamon, nutmeg, vanilla and marshmallows. Oh yes. Slice up your apples all thin-like. I used a mandolin! I love it. And it loves me. Toss those slices into a skillet over medium heat, and add the brown sugar, cinnamon, nutmeg and vanilla. Sauté until they start to soften and the aromas knock your face off, about 5 minutes. Then transfer them to a bowl and stick 'em in the fridge for about 15 minutes while you watch the rain and joyfully sob. Then get your biscuits all rolled out on a floured work surface. I think they become around 6 inches in diameter. Evenly distribute the apple slices among each biscuit. And top with the mallows! Maybe 1/4 cup per pocket. Something like that. Get crazy with it. Then you fold, pinch and crimp! And don't forget the egg wash. This is what gets it niiiice and golden brown on top. Like my next hairstyle. Whuuuuuuuut. Look how the marshmallows melted and started to seep out like CANDY. Dudes, prepareth thy souls. Dust a little more cinnamon on top, slice and oh, look! Fall just landed in your mouth. Is it bad form to beg? Because Imma 'bout to. Your mom called and said you could eat as many as you want. For more musings, visit her blog Bev Cooks and her Tablespoon profile. Even More Stuffed Pastry Goodness!